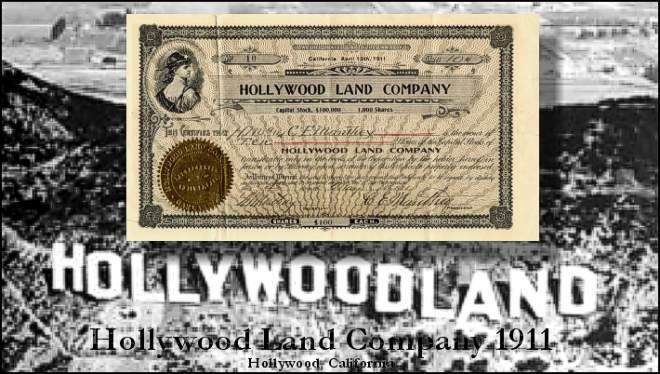 Beautifully engraved RARE certificate from the Hollywood Land Company issued in 1911. 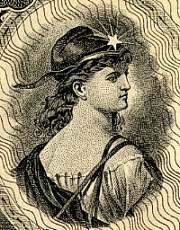 This historic document has an ornate border around it with a vignette of of women wearing a helmet with a star on the front of it and an emboeed corporate seal. This item is hand signed by the Company's President ( C.F. Manthey ) and Secretary and is over 105 years old. The company was incorporated on April 13, 1911 in California. Although we do not know the history of this company, this is the first certifcate we have seen a certificate from any Hollywood Land Company and we only have one. In 1886, H. H. Wilcox bought an area of Rancho La Brea that his wife then christened "Hollywood." Within a few years, Wilcox had devised a grid plan for his new community, paved Prospect Avenue (now Hollywood Boulevard) for his main street and was selling large residential lots to wealthy Midwesterners looking to build homes so they could "winter in California." Prospect Avenue soon became a prestigious residential street populated with large Queen Anne, Victorian, and Mission Revival houses. Mrs. Daeida Wilcox raised funds to build churches, schools and a library and Hollywood quickly became a complete and prosperous community. The community incorporated in 1903, but its independence was short-lived, as the lack of water forced annexation in 1910 to the city of Los Angeles, which had a surplus supply of water. In 1911, the Nestor Company opened Hollywood's first film studio in an old tavern on the corner of Sunset and Gower. Not long thereafter Cecil B. DeMille and D. W. Griffith began making movies in the area drawn to the community for its open space and moderate climate. In 1924, the Hollywoodland sign is constructed at a cost of $21,000 atop Mt. Lee to help promote home sales by Hollywood land developers. Thirteen 50-foot letters and four thousand 20 watt light bulbs "Hollywoodland." In 1949, the Hollywoodland Sign, originally built to last only 18 months, is in total disrepair. The City begins removing it but is halted by a public outcry by the local citizens who have come to love the sign. The sign is then refurbished but shortened to "Hollywood."